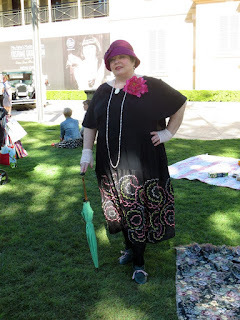 I had a fabulous time at the 1920s lawn party & will post more photos when I have time on my computer at home (not tonight cos I'm going to see the Cure in concert). I used a bone brooch to gather up the centre front of the collar, and am really pleased with much better the dress looked. Wearing the right underwear, accessories and make-up also helped me feel much happier with me+the dress. It's looser than I would like, but as it has no side fastening it needs to be able to go over my acreage of boobage. Here's a quick post with a photo taken by Desir Brulant. I haven't even seen my own photos from the weekend.